We all know that feeding a family of four is expensive, but it’s not impossible to get the weekly shop cheap, or down to just £18. Don’t be fooled, just because this is a budget weekly menu, doesn’t mean that it lacks yummy food that the whole family will love.There’s no yellow stickers or any reduced items used, just a normal shop without the thrills, as a lot of the meals are made from scratch. To be completely transparent, I don’t think anyone can shop for £18 every single week. You’re always going to need cleaning products, shampoo or toothpaste, so have a weekly budget of £35 but normally spend that. If creating your own budget weekly menu is giving you a headache, then Budget My Meals is for you. I can create your budget weekly menus, shopping lists and send you the recipes every week so you don’t even have to think about it. 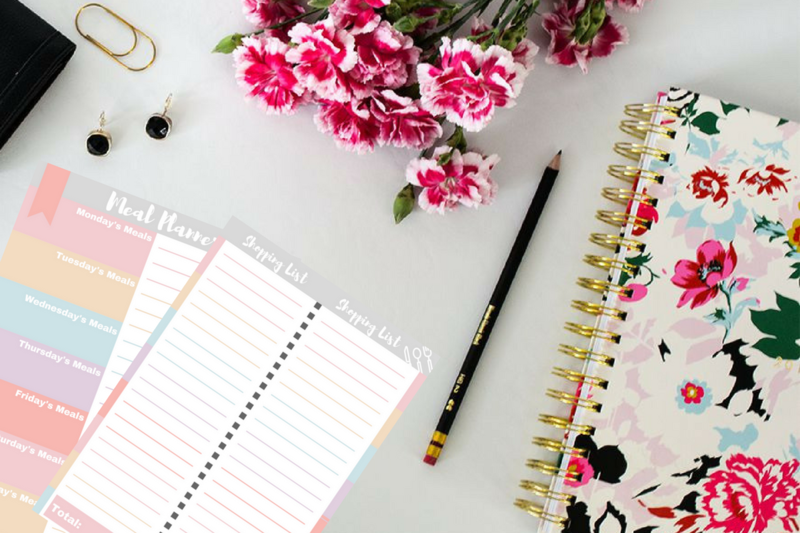 If you’d prefer to come up with a budget weekly menu yourself, then scroll to the bottom of this post to get access to The Resource Vault, where you can download and print meal planning and shopping list templates. Before you even start meal planning, check what you have already. Do you have any kitchen staples that you could use to bulk out any meals or use on days you’re late home? Write down what you want to eat this week. That means 7 days of meals. As you fill in your dinners for the week, start writing your shopping list. Using a weekly meal plan sheet like mine below) helps to break down your list into easy to read chunks. Do you need shampoo? Toothpaste? Are your staples full? Adding one of these items a week will help you level out your shopping bill. If you find a few that work for you, keep them! Use them when you’re lacking inspiration. It’s a given really but it can’t help you unless you take it. Try and stick to it and watch your shopping bill tumble. Shop in discount supermarkets. Don’t be loyal, as it doesn’t pay off. To get the bill down further, bulk out curries with beans, or spaghetti bolognese with grated vegetables. Try different meats, especially if they are destined for the slow cooker. Buy frozen fruit and vegetables. You can take as much as you need, with no waste, and it’s cheaper! This is an example of a budget weekly shop at Aldi. All these meals can be prepped before hand or frozen. Some of the meals may contain a few kitchen staples like rice, pasta or herbs. If the kids are still hungry, try these breakfast muffins and freeze any leftovers. Try and make use of whatever is on the Aldi Super Six or the Lidi equivalent. Swap and change fruit and vegetable according to what’s on offer. 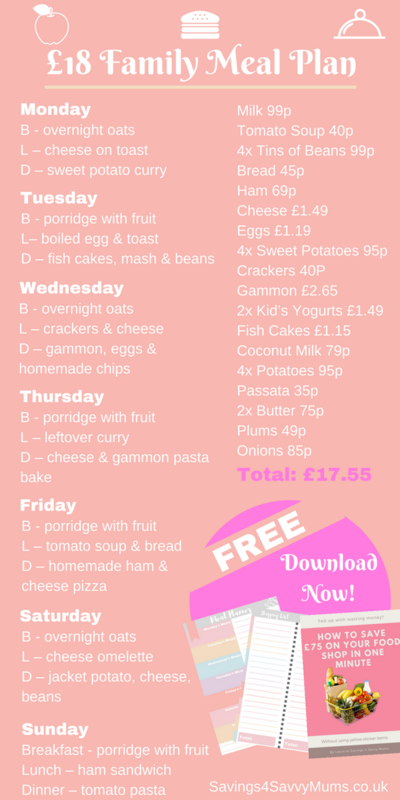 Receive your FREE budget weekly menus & shopping lists PLUS 15 FREE money saving printables you can download straight away. 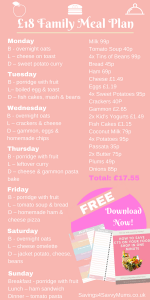 I really hope this has helped give you inspiration on how you can make a budget weekly menu for your family. Amazing Angela thank you! I’ll have to take a look. They are so fussy at the moment and to be honest we’re stuck in a bit of a rut. I’m hoping when they get older they won’t be this bad!! They used to eat so much stuff as babies!!! Great ideas but no where near enough fruit & veg included. True in a way but like I said in the post, this isn’t for every week. On the weeks I’m struggling I use this. Hope it helped anyway. Great post and some good tips. £18 shopping list, what a saving! £18 for mostly processed food. If your family isn’t eating healthy mostly then this budget is for you. If you prefer organic meat, fruits , veggies , non-dairy milk, eco friendly supplies then it would be way too high. Just wondering how you have porridge and fruit without buying oats and fruit. And do you make porridge with water, otherwise how do you make porridge for four four times a week?